Simple E-Fruit - Watermelon Honeydew Cantaloupe 60mLWatermelon Honeydew Cantaloupe is a na.. Simple E-Fruit - Blackberry Blueberry Grape 60mLA delicious mix of fresh blackberries, blueberries, .. 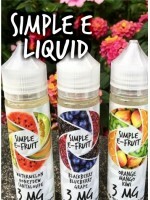 Simple E-Fruit - Passion Fruit Coconut Pineapple 60mLA delicious mix of juicy passion fruit, smooth .. Simple E-Fruit - Orange Mango Kiwi 60mLA delicious mix of fresh oranges, mangoes, and kiwi.VG/PG: 70..